FBI: Report shows "sophisticated computer fraud schemes continue to flourish"
WASHINGTON (CNN) -- Internet-based rip-offs jumped 33 percent last year over the previous year, according to a report from a complaint center set up to monitor such crimes. 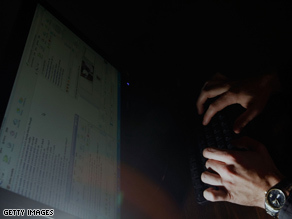 The report said that about 77.4 percent of perpetrators of Internet fraud were men. The total dollar loss from those crimes was $265 million. That's $26 million more than the price tag in 2007, the National Internet Crime Center said. For individual victims, the average amount lost was $931. "This report illustrates that sophisticated computer fraud schemes continue to flourish as financial data migrates to the Internet," said Shawn Henry, the FBI's assistant director of the Cyber Division. Americans filed 275,284 reports claiming to be ripped off on the Internet, the highest number reported since the center began keeping statistics in 2000. The dollar loss has been on a steady increase since 2004, while the number of cases referred to law enforcement has decreased steadily since that same year. Complaints to the center have resulted in several arrests, the center said, although information comes only from agencies that voluntarily provide the results of investigations. Henry said the figures show the need for computer users, in businesses and in homes, to be wary and use sound security practices while using the Internet. The center said the top three most frequent complaints were about merchandise that wasn't delivered or payment that wasn't received, Internet auction fraud and credit/debit card fraud. Other scams include confidence frauds such as Ponzi schemes, check fraud, the Nigerian letter fraud and identity fraud. One popular identity fraud scam used during 2008 involved sending e-mails crafted to appear as if they'd been sent by the FBI. Sometimes the scammers went so far as to say the mailings were from FBI Director Robert Mueller himself, according to the center. The e-mails would ask the recipient for personal information, such as a bank account numbers, claiming the FBI wanted the information to look into an impending financial transaction. One variation of the scheme, according to the center, was to send an e-mail saying the recipient is entitled to lottery money or an inheritance and the funds can be moved as soon as bank account information is supplied. The FBI has issued warnings about such scams in the past, and Monday's report included a new one: "The FBI does not contact U.S. citizens regarding personal financial matters through unsolicited e-mails." The report said that about 77.4 percent of perpetrators of Internet fraud were men, and about half lived in either California, New York, Florida, Washington, Texas or the District of Columbia. More than 55 percent of those who filed complaints were men. But the report noted that anyone who uses the Internet can be a victim, and that the ages of victims have ranged from 10 to 100. Internet crime offers unique challenges to investigators. The report said the offender and victim often live in different states and sometimes different countries, requiring multiple law enforcement agencies to cooperate and conquer any issues of jurisdiction. Another big problem is the anonymity of using the Internet. In most instances, a victim never meets the criminal. The Internet Crime Complaint Center is a partnership of the FBI and the National White Collar Crime Center.